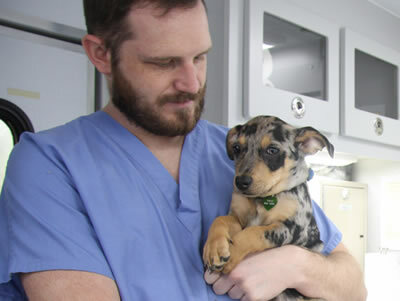 The College of Veterinary Medicine’s unique curricular structure provides nearly two years of hands-on clinical training. Years one and two of the four-year program focus on instruction in high-tech, computer-based classrooms and labs. Years three and four provide clinical instruction in such areas as cardiology, community medicine, dentistry, emergency and critical care, equine medicine and surgery, food animal medicine and surgery, neurology, neurosurgery, oncology, ophthalmology, orthopedic and soft-tissue surgery, and reproduction. The curriculum is integrated with veterinary services that include statewide animal disease diagnostic services, and extension and continuing education programs for animal owners and veterinarians.